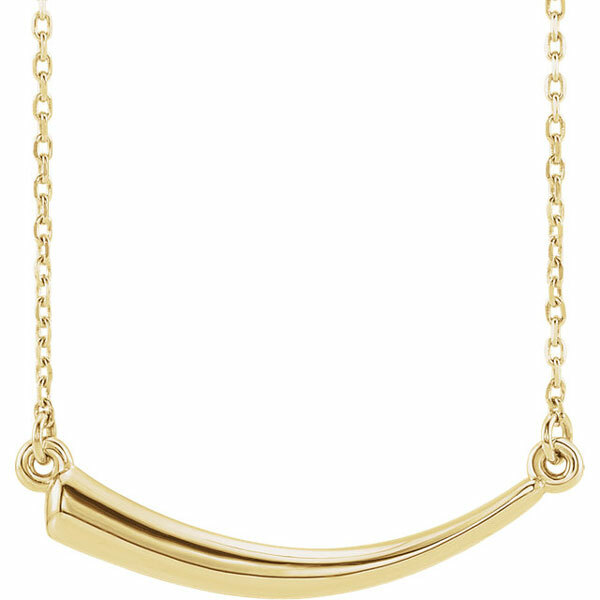 This horn necklace in 14K yellow gold from Apples of Gold Jewelry is an interesting take on the bar necklace, replacing the traditional rectangular bar with a horn shape. The 14K yellow gold of the necklace makes this horn shape stand out - the curved horn starts off larger at one end and tapers off to a smaller size at the other. The pendant measures 15/16" long and 5/16" tall, and has a chain that adjusts between 16" and 18" in length. The chain is a 1mm cable chain, and it has a spring ring closure. We guarantee our 14K Gold Horn Necklace to be high quality, authentic jewelry, as described above.